The cocoa E6 and E6i Snap-on Microphone Cable from Countryman is designed for use with the E6 and E6i earset microphones. It can be used to replace a cable in the event of a short or break and is an alternative to replacing the entire microphone. It features a snap-on design that has a Waterproof 2.5mm Sub-mini connector for use with Lectrosonics wireless bodypack transmitters. These replaceable cables are available in various connector types to accommodate various wireless microphone transmitters. This cable features a Waterproof 2.5mm Sub-mini connector for use with Lectrosonics wireless bodypack transmitters. 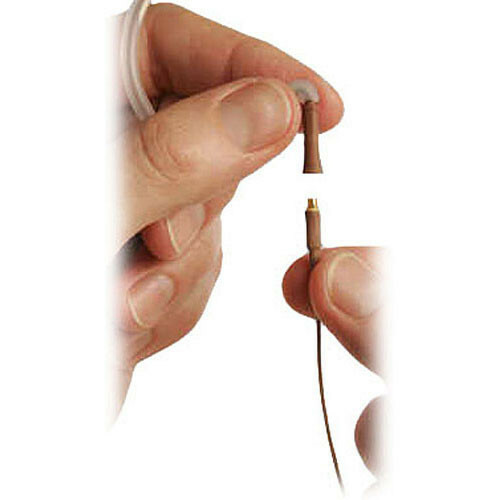 The Duramax 2mm diameter cable provides extra strength, flexibility and durability. The replacement cables are available in matching E6 and E6i ear set colors. This cable is cocoa.